Men can choose stylish gowns for their big day. Men desiring to wear a wedding dress may have had a difficult time in the past, but some boundaries are shifting. Transgender, transvestite, transsexual, and cross-dressing men may want to find wedding dresses when they decide to tie the knot with their partners. Bridal boutiques don't typically cater to the male customer, so getting the right fit for a dress can be challenging. However, options aren't limited for a man in search of the perfect gown. Searching in a salon is the best way to guarantee the gown will be the best fit. However, it's also good to have alternatives to finding a dress in a shop. Upon starting your search, you will want to check with local bridal shops and salons. Calling salons ahead of time and asking male friends where they obtained their dresses can help men choose a bridal shop that will offer them a positive experience. The popular auction site eBay offers a vast array of wedding dresses, from never been worn to gently used, that are often cheaper than buying from a salon in the first place. Check out the measurements and photos carefully and be sure the seller has a good rating and positive feedback. Other places to find used wedding dresses include thrift stores, consignment shops, costume rental store sales, and boutiques that cater to cross-dressers. Show some fashionable flair and design your own wedding dress. Men who have sewing skills or know someone else who does can use a wedding dress pattern to create a cheap wedding dress that looks stunning. Pick up materials on sale to make the dress even more affordable.For those with less experience on the sewing machine, designing a dress with the help of a tailor or seamstress is also an option. Bringing in photos of elements and talking about the overall theme of the wedding can help the designer create a one-of-a-kind dress that will fit perfectly, no wedding dress alterations from a seamstress necessary. Pick up some free wedding dress catalogs to look at during leisure time. These catalogs often have designer dresses in a number of styles to choose from. Measuring and fit tips might also be included. Online catalogs also offer thousands of dresses with just the click of a button. Save money by searching for clearance wedding dresses at closeout prices. Be sure to understand the return policy of catalog orders clearly, especially if the dress is made to order. Wedding dresses are notorious for being cut smaller than what Americans are used to seeing. Tag shock is not uncommon when an American size "10" ends up in a size "14" in the dress. A number of gowns are sized according to European or Japanese standards. Women's dress waists are often just above their belly button, rather than below. Length of torso should be considered if a dress has a special waistline. Take bust line measurements wearing the foundation garments that will be worn with the dress on the wedding day. Just like women, men who are searching for a gown should consider their body type and what looks best on them. A drop-waist might highlight a bulging stomach, while an empire waistline is often forgiving. 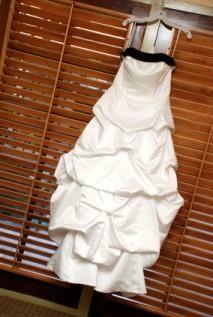 Modest wedding dresses with sleeves and high necklines can camouflage masculine biceps and chests. 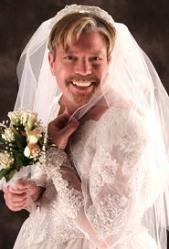 Men who wish to get married wearing a wedding dress should not be deterred by setbacks. Whether the style desired is a designer wedding dress, informal wedding dress or a themed wedding dress, it may take a while to find the perfect one. Keeping an open mind about the styles and sizes of wedding dresses for men will help make the process easier.